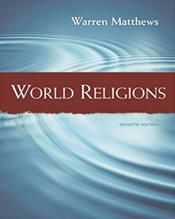 WORLD RELIGIONS, Seventh Edition, methodically introduces readers to the richness and diversity of these traditions. The "Worldview" sections in particular make this the most helpful textbook for comparative analyses of the religions. In these sections, readers can see how the different religions approach a common set of ten themes that are fundamental to all traditions, including the nature of the Absolute, the place of humans in the world, rituals and symbols, and the prospects for life after death. Furthermore, this text combines insightful, engaging prose with maps, photographs, timelines, excerpts from sacred texts, and other helpful pedagogical aids that provide a comprehensive yet accessible survey of world religions. Warren Matthews thoughtful and balanced approach depicts the unique traditions and perspectives of diverse world religions with objectivity and respect.